Who doesn’t love of bowl of perfectly seasoned chili on a cold winter day? 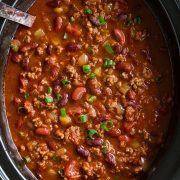 I love this chili because it amps up the flavor compared to your average chili, with its fresh salsa, a kick of lime and from the subtle flavors like the oregano and paprika. 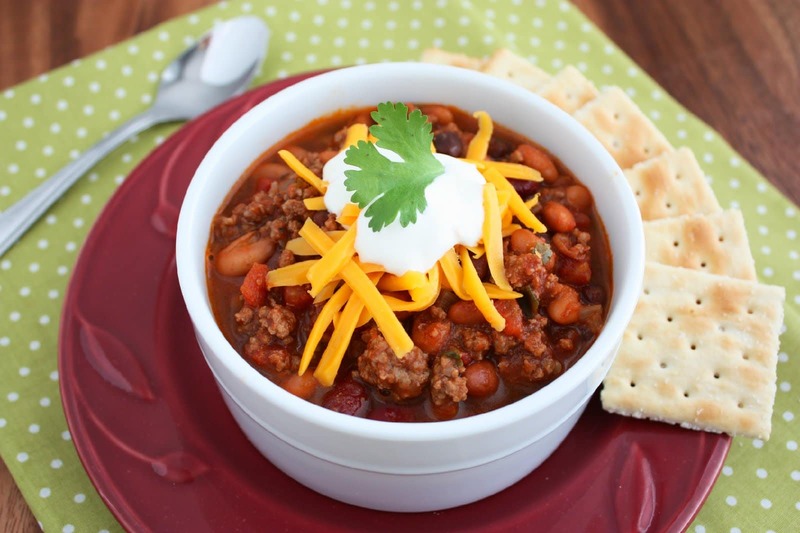 It has the perfect blend of spices, and it’s deliciously hearty with it’s combination of beans and flavorful beef! I decided my average chili just needed a bit more, so I came up with this recipe to add an exciting kick! 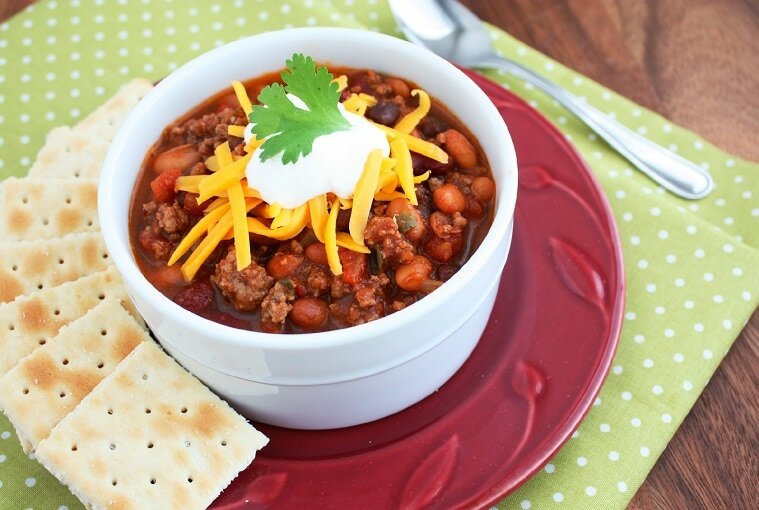 Give it a try and it will likely become your new favorite, go to chili recipe! Enjoy! 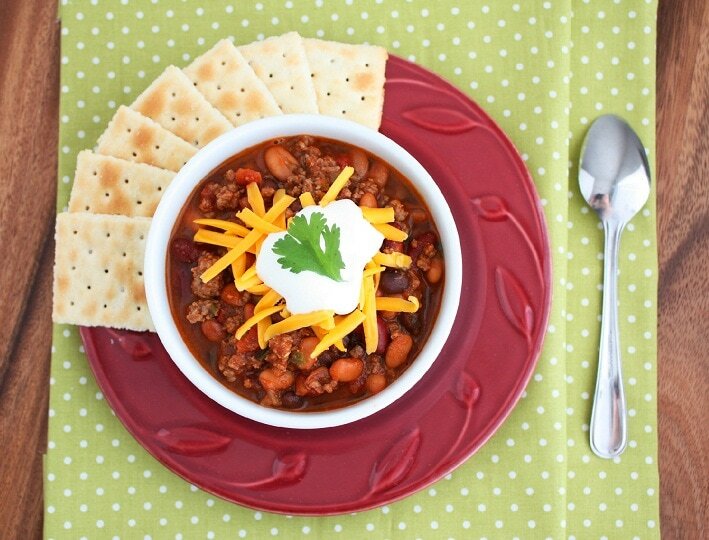 Classic comforting chili, perfect for a fall or winter day! Drizzle olive oil into a large non-stick saucepan over medium high heat. Add ground beef and saute until browned, breaking up the meat as it cooks (being careful not to do it too often as you will make the beef grey). Drain beef onto a plate, reserving 1 tbsp of the oil in the pan. Set beef aside. Add green onions, yellow onion and garlic to the pan and saute over medium heat until tender about 3 minutes. 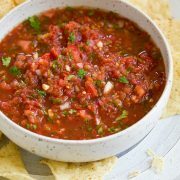 Add salsa, diced tomatoes, tomato sauce, chili powder, cocoa powder, cumin, paprika, oregano, salt, pepper, lime juice, cilantro, chicken broth and browned ground beef. Reduce heat to low, cover saucepan and simmer for 45 minutes. Stir in kidney beans, black beans and pinto beans and cook over medium heat until heated through about 5 minutes. Serve warm with optional cheddar cheese and sour cream. I love chili over baked potatoes! It’s a fall/winter favorite! For restaurant style baked potatoes (the kind where you want to eat the peel). Preheat oven to 400 degrees. Rinse and scrub potatoes well. Dry potatoes with a clean kitchen towel. Poke each potato several times with a fork. Place each potato over a piece of aluminum foil, large enough to generously cover it. In a small bowl combine extra virgin olive oil, garlic powder and freshly ground black pepper. Baste 1/2 tbsp olive oil mixture over each potato. Sprinkle each potato with 1/4 tsp coarse sea salt, covering both sides of the potato. Wrap each potato tightly in the foil and place opening side up on a baking sheet. Bake potatoes for 1 hour.